From nursing students to medical professionals who have many years of experience under their belts, a day won’t go by without you needing your trusty penlight. As much a tool of the trade as stethoscopes and thermometers, penlights have a bunch of critical factors, one of the most common being checking a patient’s reaction times and brain function. Shining a penlight into the patient’s eyes and checking the contraction of the pupils, whether they are responsive to the stimuli and whether they react at the same time, can be useful for checking whether or not a patient is under the influence, experiencing a concussion or hindered brain function, and more. 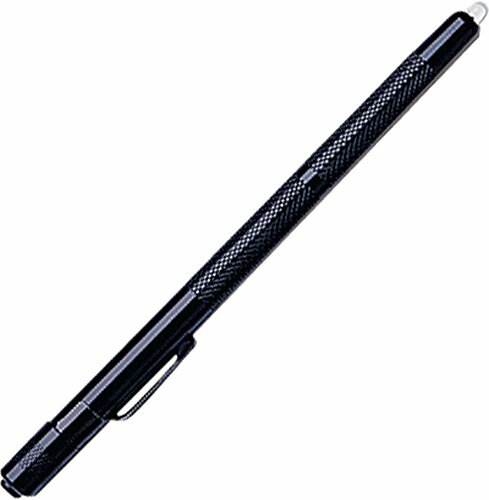 Penlights are also much more suitable for throwing a focused but narrow beam of light on wounds, bruises, infected areas and so on, so you can see what you’re dealing with clearly and make out any symptoms indicative of the problem, like the discoloration of skin indicating jaundice. Nurses also find penlights a handy tool to use when checking and setting up IVs and otherwise ensuring everything is alright without having to risk waking a snoozing patient up by switching on any brighter lights. But not any penlight is up for the job. Too bright, and you can risk blinding your patients when you try to check their eyes, and too fragile or of poor design, and you’ll find yourself sinking more money into a tool that doesn’t return a proportionate amount of pay-off. So which are the best penlights for doctors? Here are our top picks. One of the major selling points of a penlight over a regular old flashlight, apart from the moderate light intensity since you obviously don’t want to hurt or damage your patient’s eyes by shining a tactical flashlight into them, is the portability and convenience of use. And this great little option ticks all of those boxes. Sleek and professional, it’s no coincidence that this tool very closely resembles a pen, just the right shape and size to tuck into your shirt or labcoat pocket – with a clip to secure it – so you have it on whenever you need it without having to lug anything too cumbersome around. Unlike many disposable options out there, which need replacing through frequent intervals, this durable option promises longevity, the slow-burning and energy-efficient LED bulb promising a lifetime of 100,000 hours before needing to be replaced. With a battery life of 60 hours at a stretch (and powered by three AAAA batteries), you’re not going to have to worry about replacing a disposable unit or your batteries too often. You also don’t have to worry about accidentally blinding your patients, since the lumens range is appropriately low (with a maximum brightness of 10 lumens) with a handy little glare guard protector. The sleek body of the penlight is structured out of waterproof and sturdy aluminum, hardy yet lightweight (the penlight weighs just 1.1 ounces), with a non-slip knurled grip convenient for grasping in sanitized or gloved hands. The hardy aluminum alloy body and 15 hour runtime of the penlight, powered by two Triple A batteries, make this a great medical penlight on a budget, with plenty of functionality packed into its lightweight but durable body. The long lasting LED lightbulb can throw a maximum of 180 lumens of light, powerful enough to let you examine the patients’ throat and wounds for accurate prognosis as well as thoroughly and unobtrusively check up your patients and hospital equipment without disturbing their rest. 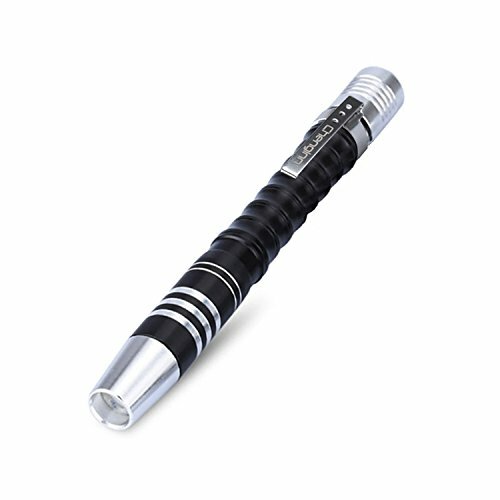 The penlight also features a pupil gauge to measure the patient’s pupil responses, the warm white light ideal for accurate assessment of muscle, tissue or skin coloration and condition, the removable clip letting you secure the penlight to your pockets so you have it on you wherever you go. Now, while rugged and long-lasting penlights are great, you might want to invest in a disposable one if you’re prone to losing penlights or are a medical student who only needs practice with using a penlight rather than needing one full-time. 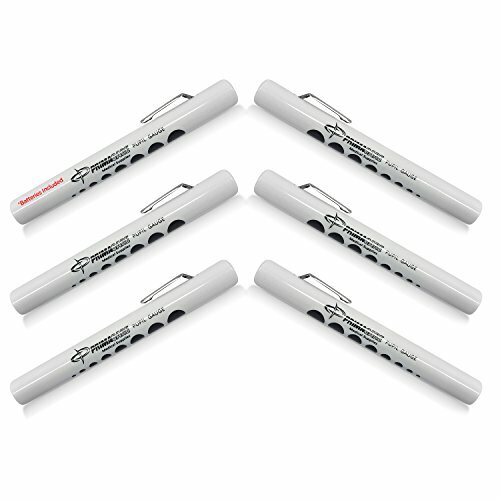 The Primacare disposable penlight set comes with 6 penlights, marked with a handy pupil gauge along the side to guide the user; though not fitted with LED lightbulbs (hence the shorter lifespan, even though one of these may last you anywhere between weeks to months depending on intensity of use), the incandescent bulb type means the pre-focused light isn’t too bright to hurt your eyes, yet bright enough to let you thoroughly examine areas like the throat or any wounds, infections and bruises closely. The molded plastic body makes for a super lightweight penlight you can carry about in your pocket, a clip securing it in place for easy access. Once the battery runs out, you can simply dispose of the unit you had been using and pick up another from the set. 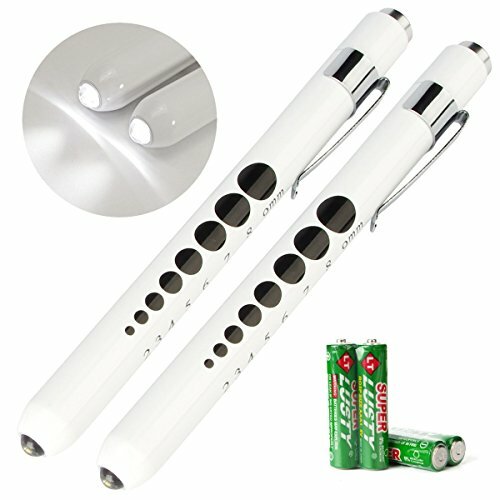 Pre-focused to direct light exactly where you need it, this penlight, with its durable but lightweight aluminum alloy body and sleek ceramic white color, comes in a set of two, both featuring a crisp and handy pupil gauge along one side and a ruler on the other. Operable with a simple click, the LED bulb of the penlight promises better longevity and more energy saving. Powered by Triple AAA batteries (included with the set), the convex shape of the bulb ensures the light is focused enough to let you test your patient’s reflex times and properly examine any injured or affected areas without being too glaringly bright. Warm white light lets you accurately examine things like discoloration and the inside of the throat and ears for accurate diagnosis. A great option for beginners who want to get some experience working with a little more than a simple disposable penlight, this unit also features the classic metal clip to secure it into your pocket for easy access.